Few personify French elegance better than Inès de la Fressange. The iconic model with the big personality was the first to be contracted by a major couture house back in 1983, when Chanel signed her to represent the brand. She spent six years as Karl Lagerfeld’s muse before a much-ballyhooed falling-out: In 1989, de la Fressange was chosen as France’s new “Marianne,” the symbol of that country. Lagerfeld wasn’t impressed, saying that the idea of Marianne was everything that was “boring, bourgeois and provincial.” The outspoken designer wasn’t interested in dressing a “historic monument.” De la Fressange went on to cultivate her own talents as a designer, eventually opening a boutique. She went on to consult for Jean Paul Gaultier and helped reinvent the Roger Vivier shoe brand. De la Fressange resurfaced on Gaultier’s spring 2009 runway at the age of 51, looking more confident and gorgeous than ever. (I remember her once telling me that, as we age, we get “the faces we deserve,” meaning that those who are genuinely nice always have a pleasurable countenance.) Some speculated that her return to modelling would be a one-shot deal. But she strutted the catwalk at the Grand Palais last October for Chanel’s spring 2010 presentation, showing that her 20-year feud with Lagerfeld was history. In fact, de la Fressange is one of the stars of Chanel’s new multigenerational spring campaign alongside 40-year-old Brit Stella Tennant and 23-year-old Danish model Freja Beha Erichsen. I caught up with the vivacious 53-year-old mother of two in Paris just after she appeared in Chanel’s show last fall and again at the recent couture shows to talk about fashion, aging, insecurity and putting your best foot forward. JEANNE BEKER: How does walking in a show today compare to walking in shows when you first started? 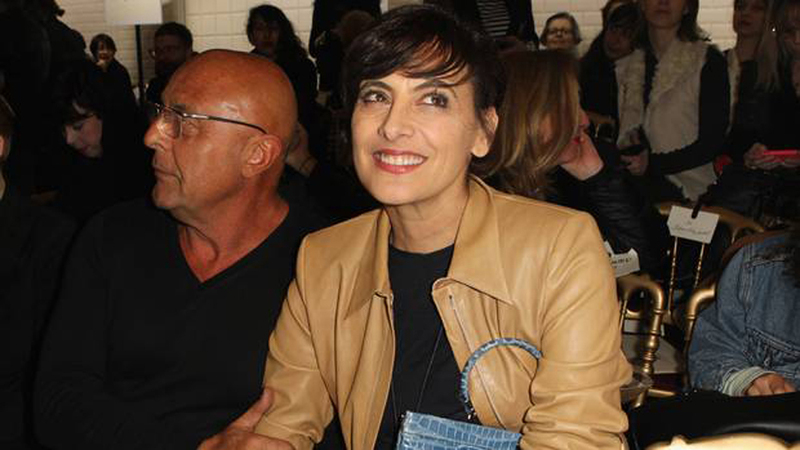 INÈS DE LA FRESSANGE: Now you have to be a little more serious. I used to joke around so much before, like jumping off the runway or sitting next to the journalists or coming out with my dog or taking pictures. But that was a certain time – back in the eighties – when we wanted to show how we were all so cool and different and there was a kind of prejudice toward models then – people felt they were all very proud and the atmosphere at shows could be quite stiff. Nowadays, it’s changed and now everybody knows that Chanel is very rock ‘n’ roll. We don’t have to do all those funny, stupid things that I used to do. JB: What is it about the Chanel brand that strikes a chord with you? IDLF: Chanel suits a lot of people. Karl knows a little about his work and he knows women and how to help them. I quite like Chanel. It’s easy when you don’t have a lot of imagination and you’re in a hurry. Just put a Chanel thing on and you’ll be fine! JB: You were initially brought back to the runway by Jean Paul Gaultier. Do you have a lot of his clothes in your wardrobe? IDLF: Darling, I’m a friend of Jean Paul’s and that means if I have a party or something to go to I just call the press attaché and say I need something to wear. That’s my life. But then it’s like being Cinderella. I have to send the thing back the next day! JB: How proud are you to be in the new Chanel campaign? IDLF: I haven’t seen the images yet. It was nice shooting the campaign in Saint-Tropez – we were very lucky because it was sunny – and I did see the pictures on the computer when we shot them. But I haven’t seen them again. Everybody’s congratulating me, but I haven’t seen anything! JB: It’s wonderful that Chanel is celebrating three generations of women. And the fact that Karl is using older models on the runway must be very uplifting for women out there. IDLF: That’s true. There are so many women who are over 30, but they think it’s forbidden, because they open the magazines and they don’t see any pictures of women their age. They don’t have any role models. It’s like they’re being told to disappear, or just be young or use lots of Botox. And that’s not nice. But Karl is showing them that he likes all women, even older women, you know? You can be trendy, dress well, take care of yourself and have children and grandchildren and still be okay. I mean, that’s really obvious, but sometimes the magazines don’t show that. [She begins joking with the cameraman. ]Please put more light on me when I say these kinds of things! I don’t do Botox, but I do need a good light! JB: You really seem to have accepted who you are and you’re comfortable in your own skin. But do you ever have those moments where you’re a little insecure? IDLF: Every morning! Come on! I open my closet and say, “I don’t have anything to wear!” Just like an older woman. And my boyfriend doesn’t understand why all these T-shirts are not good and all these jeans are not good and all these sweaters are not good and I really deserve better. And he thinks I have a lot of pairs of shoes and a lot of handbags and that’s enough. But he just doesn’t understand older women. JB: It’s never enough in fashion. IDLF: Listen, it’s normal not to feel good every day. Thank God there are hairdressers and makeup artists that can give you advice. And one should really listen to sales clerks, too. It’s not that they always just want to sell you anything, you know? Sometimes they’ll encourage you to put a turtleneck on and you may think your neck isn’t long enough and it won’t fit you. But you should try it anyway. People should try making changes sometimes. Try not to always wear your hair or your makeup the same way. And there are professional people out there to help you. After all, when you feel sick, you go to see a doctor. When it comes to buying clothes, you have to go to a shop and trust the people selling there.